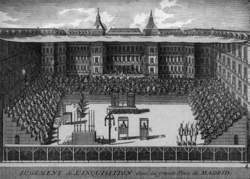 An engraving depicting the court of the Spanish Inquisition in Madrid. The Inquisition began in 1233 as a concerted effort by the Church of Rome to arrest, torture, and execute anyone thought guilty of being a heretic, a witch, a sorcerer, or one of Satan’s minions on Earth. In 906 C.E. the Canon Episcopi, by Abbot Regino of Prum, condemned as heretical any belief in witchcraft or in the power of sorcerers to transform people into animals. The Christian clergy of that time took little notice of the edict, for it was the consensus that those individuals who believed that they could fly through the air or work evil magic on another person were allowing Satan to deceive them. In 1000 Deacon Burchard, later archbishop of Worms, published Corrector, which stressed that God alone had the kind of power that the untutored masses were attributing to witches. Heretics were another matter, and in 1022 there occurred the first fully attested burning of a heretic, in the city of Orléans. By the early thirteenth century the Cathar sect had become so popular among the people that Pope Innocent III considered it a greater threat to Christianity than the Islamic warriors who challenged the Crusaders in the Middle East. To satisfy his outrage, he ordered the only crusade ever launched by Christians against fellow Christians, declaring as heretics, witches, and devil-worshippers the Albigensians, as the Cathars of southern France were also known. The Papal Inquisition came into existence in 1233 with the Excommunicamus of Pope Gregory IX, who urged local bishops to become more vigorous in ridding Europe of heretics, then lessened their responsibility for determining orthodoxy by establishing inquisitors under the special jurisdiction of the papacy. The office of inquisitor was entrusted primarily to the Franciscans and the Dominicans because of their reputation for superior knowledge of theology and their declared freedom from worldly ambition. Each tribunal was ordered to include two inquisitors of equal authority, who would be assisted by notaries, police, and counselors. Because they had the power to excommunicate even members of royal houses, the inquisitors were formidable figures. In 1244 Montségur, the last center of Albigensian resistance, fell, and hundreds of Cathars were burned at the stake. The headquarters of the Inquisition had been established in Toulouse, and in 1252 Pope Innocent IV issued a papal bull that placed the inquisitors above the law and demanded that every Christian—from the aristocracy to the peasantry—assist in the work of seeking out witches and heretics or face excommunication. In 1257 the church officially sanctioned torture as a means of forcing witches and other heretics to confess their alliance with Satan. The Inquisition employed judges, jailers, exorcists, firewood-choppers, and torture experts to destroy the evil ones who were threatening the ruling powers. It was not long before the inquisitors discovered a foolproof method for perpetuating their gory profession: Under torture, nearly any accused witch could be forced to name a long string of her “fellow witches,” thereby making one trial give birth to a hundred others. The inquisitors would descend upon a particular location for weeks or months and bring suit against any person there suspected of heresy. Lesser penalties were levied on those who came forward of their own volition and confessed their heresy than on those who ignored the summons and had to be placed on trial. The tribunal allowed a grace period of about a month for such voluntary confessions. The penances and sentences for those who confessed or were found guilty during the trial were pronounced at a public ceremony known as the sermo generalis or auto-da-fé; and might consist of a public whipping, a pilgrimage to a holy shrine, a monetary fine, or the wearing of a cross. The most severe penalty that the inquisitors could pronounce was life imprisonment—but they could turn over a confessed heretic to the civil authorities, in which case it was quite likely that he or she would be put to death. By far the most common method of execution was burning at the stake. The wealthy and powerful Knights Templar, long considered among the greatest defenders of the church, were accused of heretical acts such as invoking Satan and worshipping demons. In spite of a lengthy trial and 573 witnesses for their defense, the arrested Templars were tortured en masse and burned at the stake, and their order was disbanded by Pope Clement V. In 1313 as he was being burned to death in front of Notre Dame Cathedral, Jacques de Molay, the Knights Templar grand master, recanted his torture-induced confession to demon worship and invited the pope and the king to meet him at heaven’s gate. When both dignitaries died soon after de Molay’s execution, it seemed to the public at large to be a sign that the grand master had been innocent of the charges of heresy. In 1320 Bernard Gui published Practica, an influential instructional manual for inquisitors, in which he urged them to pay particular heed to arresting those women who cavorted with the goddess Diana. Four years later, in 1324, Ireland’s first witchcraft trial convened when Alice Kyteler was found guilty of consorting with a demon. In 1484 Pope Innocent VIII became so angered by the apparent spread of witchcraft in Germany that he issued the papal bull Summis Desiderantes Affectibus (Desiring with Supreme Ardor) and authorized two trusted Dominican inquisitors, Heinrich Institoris (Henry Kramer) and Jakob Sprenger, to stamp out demonology in the Rhineland. By 1486 Kramer and Sprenger had published Malleus Maleficarum, the “Hammer for Witches,” which quickly became the bible of the witch hunters. The book earnestly refuted all those who would claim that the works of demons existed only in troubled human minds. Certain angels fell from heaven, and to believe otherwise was to believe contrary to the true faith. And now these fallen angels, these demons, were intent upon destroying the human race. Any persons who consorted with demons and became witches must recant their evil ways or be put to death. The first major witch hunt in Europe occurred in Switzerland in 1427; and in 1428, in Valais, Switzerland, there was a mass burning of a hundred witches. Numerous scholars have observed that beginning in the fourteenth century, the close of the Middle Ages, the Christian establishment of Europe was forced to deal with an onset of social, economic, and religious changes. Also during this time, from 1347 to 1349 the Black Death, bubonic plague, ravaged the European nations, greatly encouraging rumors of devil-worshippers who conspired with other heretics, such as Jews and Muslims, to invoke Satan to bring about a pestilence that would destroy Christianity and the West. During most of the Middle Ages, those who practiced the Old Religion and worked with herbs and charms were largely ignored by the church and the Inquisition. After the scourge of the Black Death, witchcraft trials increased steadily throughout the fourteenth and fifteenth centuries. Separate from the Inquisition that exerted its jurisdiction over the rest of Europe, in 1478, at the request of King Ferdinand V and Queen Isabella, papal permission was granted to establish the Spanish Inquisition. The support of Spain’s royal house enabled Tomás de Torquemada to become the single Grand Inquisitor whose name has become synonymous with the Inquisition’s cruelest acts and excesses. Torquemada is known to have ordered the deaths by torture and burning of thousands of heretics and witches. However, the Spanish Inquisition largely focused persecution on the Marranos or conversos—Jews suspected of insincerely converting to Christianity, converts from Islam similarly thought to be insincere in practicing the Christian faith, and in the 1520s, individuals believed to have converted to Protestantism. From about 1450 to 1750 some forty thousand to sixty thousand individuals were tried as witches and condemned to death in France, Germany, Austria, and Switzerland. Perhaps three-quarters of the victims were women—although some authorities assert that judges of the great tribunals examined, tried, and tortured female witches at a ratio of 10-to-1, 100-to-1, or 10,000-to-1 over men. Only in the Scandinavian countries were men accused of being witches and sorcerers at an equal or larger percentage than women. The witch hunters in France were not as gender-biased as their counterparts in some other European nations. Of the 1,300 witches whose appeals were heard by the French parliament prior to execution, just over half were men. According to some statistics, from 1550 to 1682 France sentenced approximately 1,500 accused witches to death. Also, contrary to popular supposition, in countries such as France, where the Catholic Church was firmly entrenched, the inquisitorial church courts were much more lenient than the civil courts in demanding death sentences for accused witches. Overall, in such Catholic nations as France, Italy, and Spain, the church courts executed far fewer people than the local community-based courts or the national courts. By his own boast, witch trial judge Pierre de Lancre tortured and burned over six hundred men and women accused of consorting with demons. De Lancre was not a member of the clergy, and his concerns were social, rather than theological. He believed that sorcerers and witches were a well-organized antisocial force that sought to overthrow the established order. When Henri Boguet, an eminent judge of Saint-Claude in the Jura Mountains, presided at witchcraft trials, he was known for his cruelty, especially toward children. In his Discours des Sorciers, Boguet expressed his conviction that the devil could become either a man or woman to deceive people into his fold. He pronounced or ratified about six hundred death sentences against witches. Sometime in the 1550s a highly respected doctor, Johannes Weyer (or Weir), who believed in the power of Satan to deceive Earth’s mortals, nonetheless became a critic of the Inquisition and its claims that mere humans could really attain such supernatural powers as those which the tribunals ascribed to witches. In 1563, against strong opposition, Weyer published De Praestigiis Daemonum et Incantatiponibus ac Venificiis (On the Illusions of the Demons and on Spells and Poisons), in which he argued that the supernatural powers attributed to witches existed only in their minds and imaginations. In 1583 Reginald Scot wrote The Discovery of Witchcraft as an kind of rebuttal to Sprenger and Kramer’s “Hammer for Witches.” In Scot’s opinion, the inquisitors were sexually obsessed madmen who took delight in inflicting sadistic torture on their victims. If witches were really as all-powerful and malignant as the inquisitors claimed, Scot argued, why had they not enslaved the human race long ago? With the spread of Protestantism through Europe, Pope Paul III in 1542 established the Congregation of the Inquisition (also known as the Roman Inquisition and the Holy Office). It consisted of six cardinals, including the reformer Gian Pietro Carafa. Although its powers extended to the whole church, the Holy Office was less concerned about heresies and false beliefs of church members than about mis-statements of orthodoxy in the academic writings of theologians. When Carafa became Pope Paul IV in 1555, he approved the first Index of Forbidden Books (1559) and vigorously sought out any academics who might be promoting any thought that favored Protestantism or otherwise offended church doctrine. It is ironic that Germany, the country that gave birth to the Protestant Reformation, was also the very center of the witchcraft trials in Europe, condemning to the stake 48 percent of all those who were accused of consorting with demons, perhaps as many as 26,000 victims—82 percent of whom were women. In southwestern Germany alone, more than 3,000 witches were executed between 1560 and 1680. Perhaps the reasons for such heavy persecution of suspected witches lay in the distrust that the warring Christian factions—the Roman Catholics and the newly emerging Protestant sects—had toward one another, and their willingness to accuse rather hastily someone of opposing religious views as a servant of Satan. In 1630 Prince-Bishop Johann Georg II Fuchs von Dornheim, the infamous Hexenbischof (Witch Bishop), constructed a special torture chamber that he decorated with appropriate passages from scripture. He burned at least six hundred heretics and witches, including a fellow bishop he suspected of being too lenient. England did not really succumb to the witch craze that seized continental Europe. There was no law against witchcraft in England until 1542—and that law was repealed in 1547. Perhaps because the nation had a strong central government, as opposed to the independent city states which at that time created constant political turmoil in many of the European countries, England did not tolerate wholesale witch burnings. There were, in fact, very few burnings at all. Death by hanging was the generally prescribed death sentence. The few burnings that did occur took place on the borders where different religious faiths were in conflict and the people were more disposed to see Satan in the other person’s manner of worship. Torture could not be used against accused witches in England; therefore, only about 20 percent of those suspected of dealing with the devil were executed. The last witches executed in England—Temperance Lloyd, Susanna Edwards, and Mary Trembles, all of Bide-ford, Devon—were all hanged on the same day, August 25, 1682. The death penalty for witches in England was abolished in 1736. Estimates of the number of witches put to death in England generally run to about four hundred. Around 90 percent of those condemned were women. From 1537 to 1722 in Scotland, at least three times as many witches were hanged as in England—informed counts range from 1,350 to 1,739 victims—with women making up about 86 percent of the total. The last witch in the whole of the British Isles to be executed was Jenny Horn of Sutherland, Scotland, who was burned at the stake in 1722. Mrs. Horn had been tried together with her daughter, who, the jury decided, was a victim of her mother’s witchcraft, rather than an accomplice. The Inquisition and the church itself had very little part in any witchcraft trials after the latter part of the seventeenth century, but the Holy Office continued to serve as the instrument by which the papal government regulated church order and doctrine. In 1965 Pope Paul VI reorganized the Holy Office and renamed it the Congregation for the Doctrine of the Faith. Various texts and historians have claimed that during the four centuries of active persecution, the number of innocent people executed by the Inquisition for the practice of witchcraft was as high as forty thousand. In 1999 Jenny Gibbons released the results of her research in official trial records, which verified that approximately 75 percent to 80 percent of those accused of witchcraft were women but also indicated that the total number of men and women actually hanged or burned for the crime probably did not exceed forty thousand. The author and scholar Margot Adler discovered that the source of the oft-quoted “9 million” witches put to death was first used by a German historian in the late eighteenth century who took the number of people killed in a witch hunt in his own German state and multiplied that figure by the number of years various penal statues existed, then extrapolated the result to correspond to the population of Europe. Just as in the Inquisition of the Middle Ages or the Witches' trials of the early Modem Age, the accused were not offered the opportunity to defend themselves. He wrote Superstition and Force (1866), Studies in Church History (1869), and then his three most important works: A History of the Inquisition of the Middle Ages (3 v.